The Germans call it "Hundesport", dog sport. For generations, people from Europe and North America have been drawn into this unique idea of participating in an active sport with a dog. 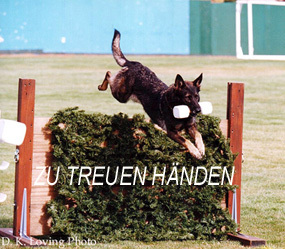 Schutzhund offers this in a way that no other sport can. It is outdoors, it is physical, it is mental, the demands are great, but the sport also offers competition and new friendships. In short, it is what all recreational sports should first be: good exercise and full of rewards. 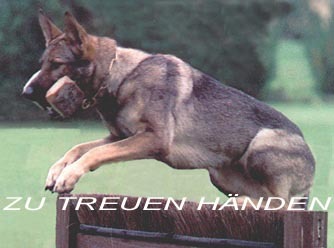 Schutzhund started at the beginning of this century as a test for working dogs, primarily German Shepherd Dogs. Its initial purpose was to determine which dogs could be used for breeding and which had true working ability. The growing demand for working dogs made more sophisticated tests and training necessary. These dogs were needed for police work, border patrol/customs, military and herding. As these tests evolved, more people participated just for the sheer enjoyment of seeing if their personal dogs could be trained as effectively as the "professional dogs". Now, over 60 years after the first formal Schutzhund rules were introduced, tens of thousands of people participate in the sport each year. 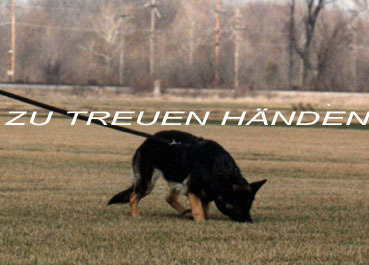 Schutzhund tests three specific areas of a dog's training and behavior. The first, tracking, requires the dog to track footsteps over mixed terrain, change directions and show absolute accuracy and commitment to finding the track. It must also find dropped articles and indicate their locations to the handler. Often this is done under less than ideal circumstances with difficult cover, bad weather conditions and an aged track. The second phase is obedience. Those who are familiar with AKC obedience will feel more comfortable in this area, as many of the exercises are similar to those in Open and Utility. 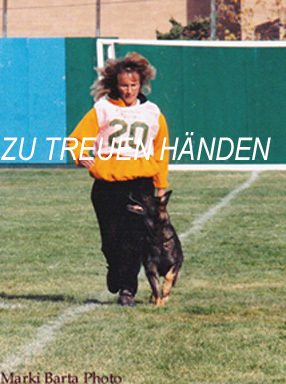 The handler and the dog work on a soccer sized trial field; championship trials take place on a football field. There is heeling, both on and off leash and through a group of milling people, with gunshots fired during the off-leash heeling. There is also a sit, down and stand-in-motion while heeling or running: the dog is expected to freeze in the appropriate position while the handler keeps moving as if nothing happened. There are two recalls from the running down and the running stand. There is a long down under distraction (while a second team is doing their routine) with a gun fire (any gun shyness automatically fails the dog). 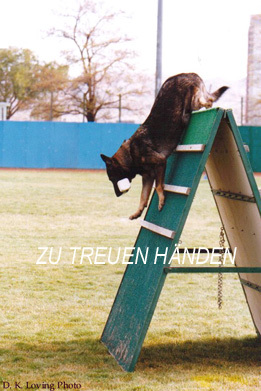 In addition to the normal dumbbell retrieval, where the SchH3 dumbbell used on the flat weighs 2 kg (4.4 lbs), the dog must also retrieve a 600 g dumbbell over a one meter jump and a six foot A-frame. A long send away with down conclude the test. The dog is not only judged on the precision of each exercise, correct position, straight fronts and finishes, but also his attitude and speed and how he performs each exercise.